In our endless quest for the best products to enhance, protect, and maintain your prized Santa Cruz guitar we have developed a premium wax specifically for SCGC’s nitro cellulose lacquer finish. See Care and Feeding on this site for general guitar-cleaning information, and Guitar Wax Instructions for instructions for SCGC Fine Instrument Wax use. 2 oz Tin. 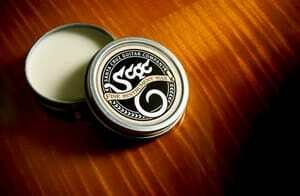 Directions: Apply SCGC wax to a clean, dry cloth, and rub it in a circular motion on the back, sides, top and neck of the guitar to clean off sweat, fingerprints and grime. Then use another clean, dry cloth to remove the excess wax from the instrument. Do not use it on or near the pickguard. Do not use it on the fingerboard, as it can linger in the fret slots. To clean the fingerboard, we recommend Dr. Duck’s Ax Wax, which can be found in most local guitar shops.